– If you answered “yes” or “maybe” to the above question, please click this link. I returned home to my monastery last week, and boy was I in for quite a shock – the monastery moved without telling you? ; changed all the locks? ; turned out the lights and pretended no one was home? I only noticed one thing at first, someone had committed the unforgivable sin of utilizing the top of the table saw as a place to water and take care of Easter lilies. After I stopped seeing red and “gingerly” removed the lilies from the table saw – we wish we could say that no lilies were hurt in the making of this blog but that would be a falsehood – I coated the entire top with “lubricant, penetrating oil and water-displacing spray” (the generic name for WD-40) and let it sit overnight. The top was scrubbed, cleaned, and a fresh coat of paste wax was applied. 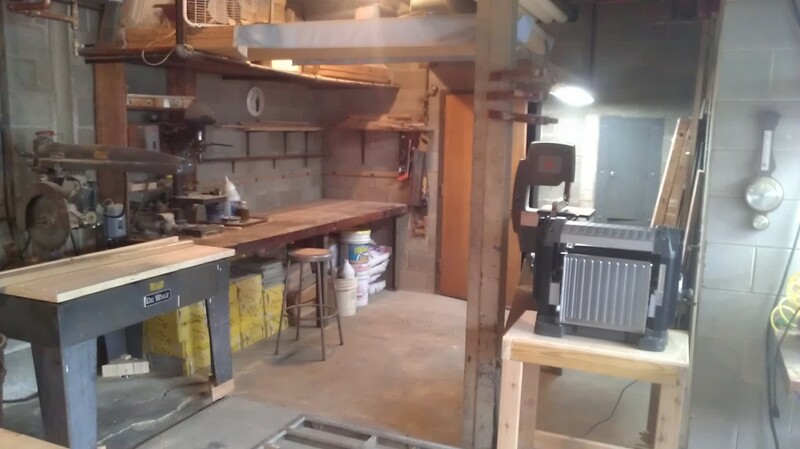 Once the emergency had passed, I took a minute to look around my shop and I noticed another pressing problem; the place was a mess, and it was not one I created. The abbey shop is not a dedicated space, and it has a tendency to become a catch-all for a lot of different things. 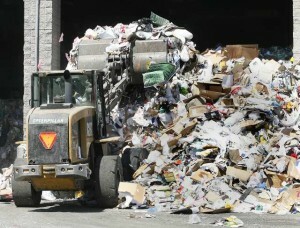 We do quite a bit of recycling (paper/cardboard, plastic, glass, and metals), which tends not to stay very neat. There are gardening materials, painting materials, work clothes from deceased monks. I think you get the picture. 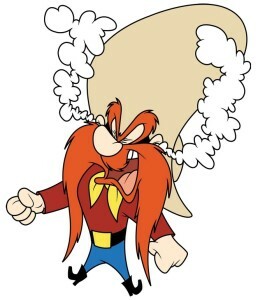 I usually have to spend a few days cleaning the place up when I return home before I can start doing any work in there. I was not too keen to continue this time-honored ritual – the unofficial motto of monks is: We’ve always done it that way – and wrote up a little proposal to the abbot. As to be expected not everything was approved, but enough was acceptable to do a major reconfiguring and cleaning of the shop. And so for two days my motto became: When in Doubt, Throw it Out – it’s none of our business, but we think he made quite a few people unhappy in the process. 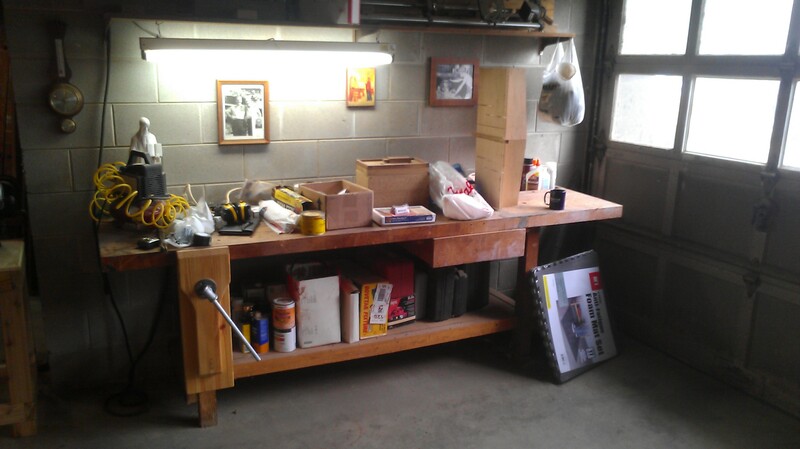 Not all of it was thrown away, some things were relocated to a different location and consolidated with similar items. I am certainly not a Pollyanna – we had to look up that reference, it means an overly optimistic person – and know that monks being monks means that items will soon start accumulating again. (There was even one item tossed in the dumpster that was returned within 24 hours.) So my list of summer projects has begun. I will build a large storage unit along the wall with plywood. It will have three modules: a closet, shelving, and deep cubby holes, all enclosed with sliding doors. I am also going to build a new outfeed table to the left of the radial arm saw – self-promotion alert: he wants the forthcoming build video to go viral – a new stand for the thickness planer (pictured in the photos), and replace the free standing router table behind the table saw with a table saw extension router lift. 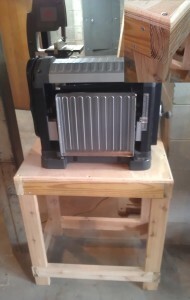 If there is time left in the summer, I will also build a small outfeed support for the table saw. My planned summer projects have adapted to fit the new situation, but I am hoping to still be able to finish Part 2 of the shoe-shine box build – in case you don’t remember is was the project he started working on in NOVEMBER – as well as adding a tail vise to the workbench and a review for the new Narex mortising chisels I bought. Let the summer begin, actually it already has with the planer stand. It was a simple enough build made from 2x4s and utilizing half-lap joints and screws. I returned home to my monastery last week, and boy was I in for a shock - the monastery moved without telling you? ; changed all the locks? ; turned out the lights and pretended no one was home? I only noticed one thing at first, someone had committed the unforgivable sin of utilizing the top of the table saw as a place to water and take care of Easter lilies.